Kitchen Remodel Ideas – Every kitchen remodel starts with a design idea. Browse our kitchen renovation gallery with traditional to modern to beachy kitchen design inspiration. Use these kitchen remodeling ideas to add value and lots of function to your home during your kitchen remodel planning phase. The first kitchen remodel ideas it’s the clean and clear modern kitchen. 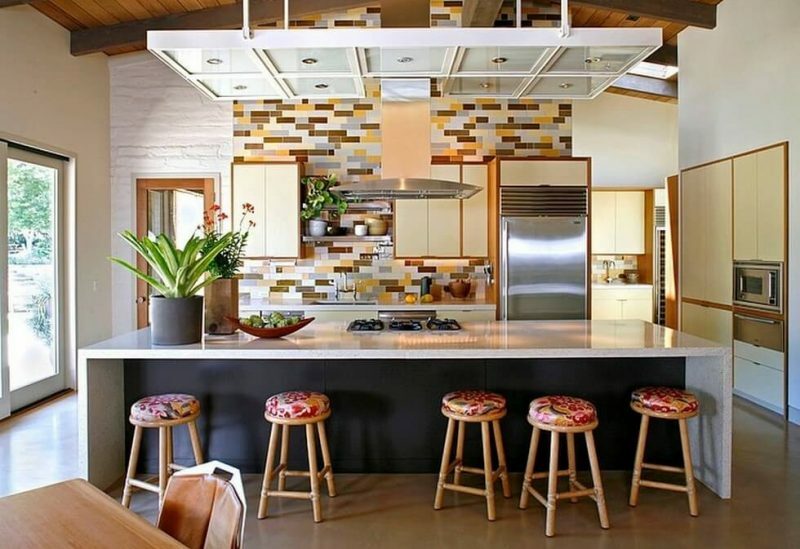 With its earthy tones, basic structure, and freedom of space, this modern kitchen design offers a good balance of masculine and feminine accents to meet the needs of any person or family. The stone countertops and backsplash offer a nice contrasting texture to the smoothness of the lacquer millwork cabinets. The warm tone of the island butcher block top creates depth in the space while functioning as the perfect prep area or space for entertaining. 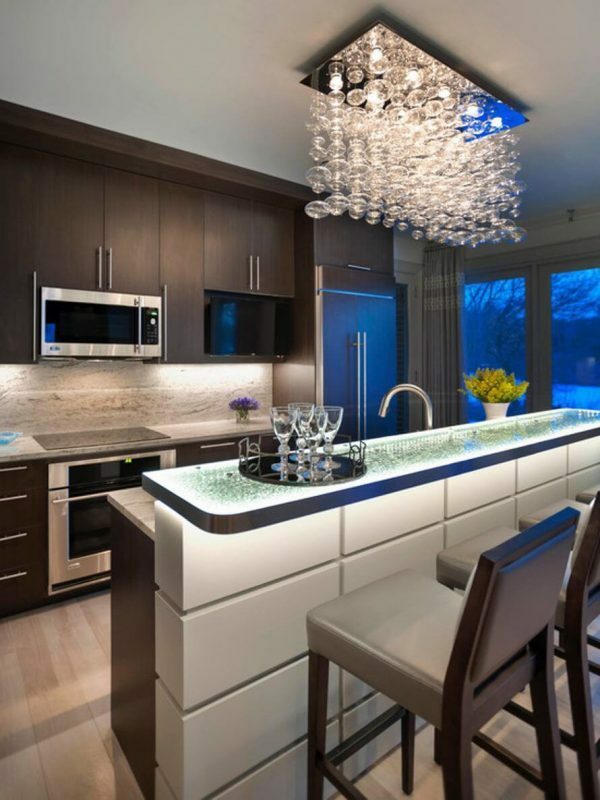 Stainless steel appliances and plumbing fixtures are enhanced by the translucent gold light pendant lights. Finally, the smooth marble backsplash pattern behind the stovetop lightens the back wall for a third texture and color combination. Blending a mix of classic industrial decor with a modern twist, The Hive skimps on color, but not style. 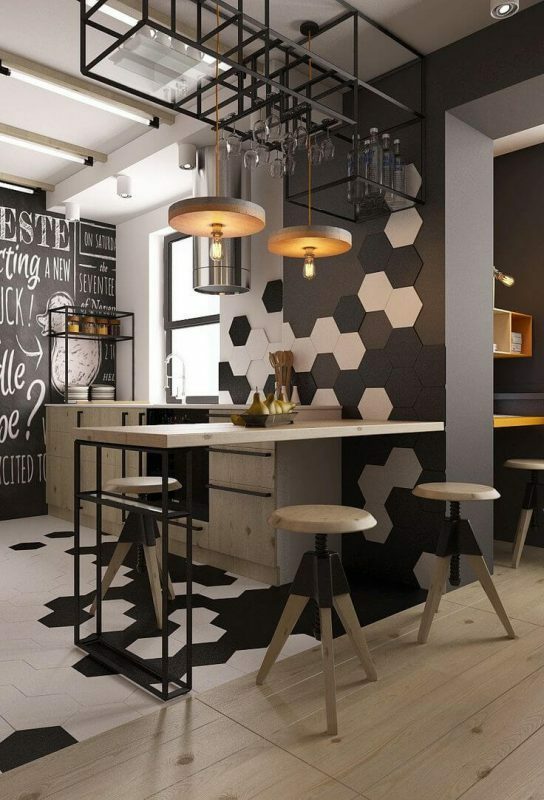 The black and white honeycomb pattern floor accent continues up the wall seamlessly blending both parts of the room together. The purity and cleanliness of bare wood on the industrial stools, countertop, and modern kitchen cabinets offer a beautiful respite from the otherwise black and white scene while the wood-disk light fixtures meld with the other furnishings. Ample storage space above the seating peninsula provides an out-of-the-way solution for glassware without sacrificing cabinet space. What the space lacks in color variety, it makes up for in design features. While the backsplash material appears to be a window, it is actually toughened glass spray painted a dark, jet black. This helps to elongate the room in an otherwise narrow space. Built-in storage in both the island and back wall provide more than adequate storage while remaining hidden from view. Walking through this space, one can hardly tell it serves as a fully-function kitchen. Appliances are cleverly hidden in the space to keep the flow of the open floor plan from being broken. 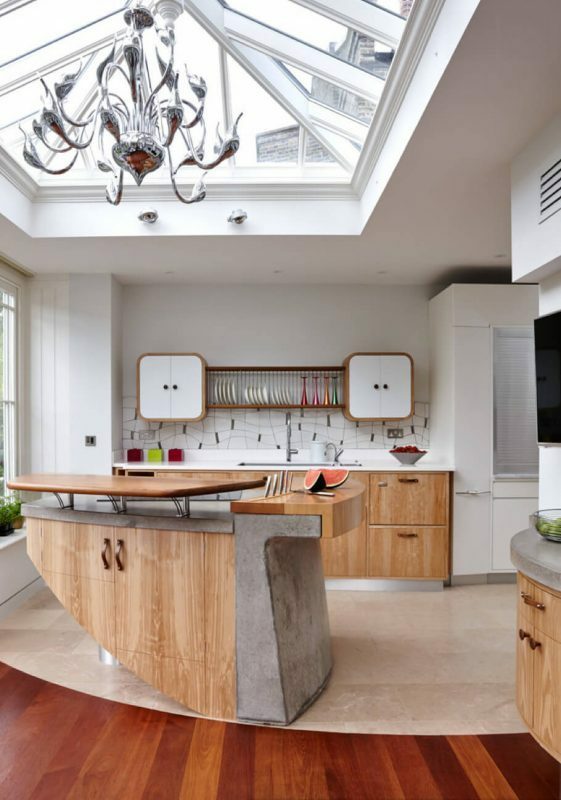 The uncommon style of the modern kitchen island combined with materials not normally found in modern kitchen designs can leave visitors feeling as though they’re just sitting down for a drink at the bar. The real feature of the room, though, is the exquisite set of chromed glass orb lights above which add warmth without being overbearing. A dark mirror-glass tiled backsplash deepens the back wall while the teal-blue upholstered stool-chairs add softness to the space. The cork-like coloring and grain of the bar stools atop cast iron footings accent the space and add a touch of rawness. Thin silver and glass pendant lights present a sleek line in an otherwise broad space. Large plate-glass windows allow the perfect amount of light in to accent the space and highlight its openness. 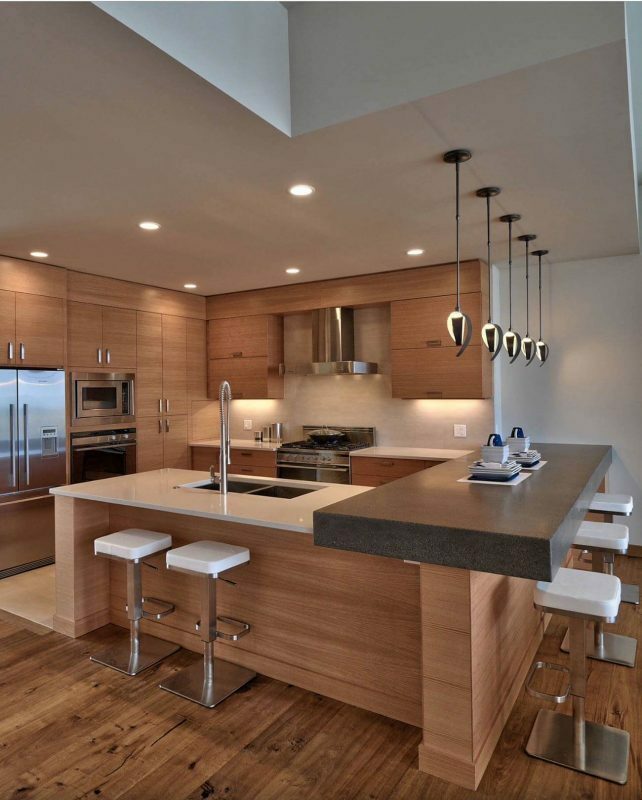 While the look of this modern kitchen almost seems unfinished, the bare wood is a highlight of the bright space. 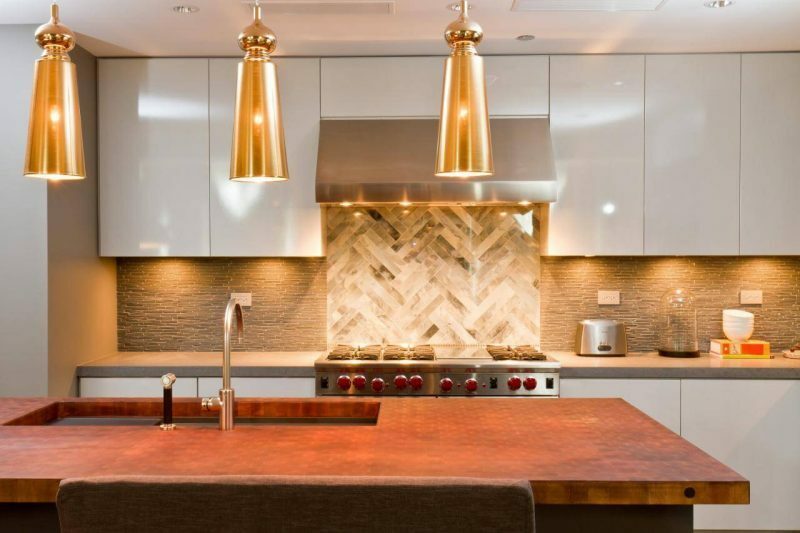 At first it evokes memories of a high school shop class, but the chevron-style backsplash brings just enough of a color scheme to deepen the space and bring out the natural, unstained colors of the modern kitchen cabinets. This design proves that the knots and grains of wood alone is enough to modernize a space without going overboard. 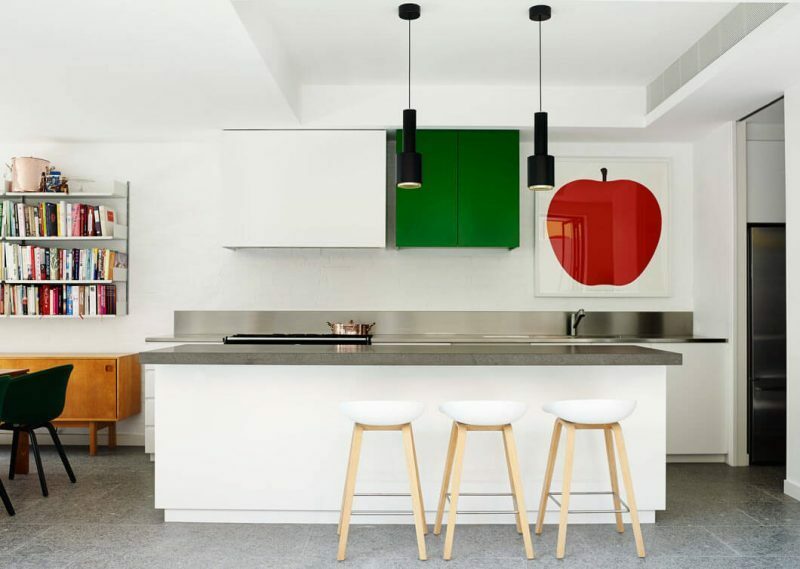 The contrast in this modern kitchen decoration is what brings the space together. Pops of color burst from a black and gray scene. Every surface is slick either by the nature of its material or by the addition of a thick layer of glass-like lacquer. Perfect color selections enabled the designer to create a space that would otherwise be lost in darkness. Color blocking, the use of bright contrasting colors on an otherwise bland background, is the key to making this space jump out at the viewer. Clear glass pendant-style light fixtures provide lighting without detracting from the intended focus of the color blocks. Cleverly placed white accessories (in this case a tea set) add a bit of dimension to the foreground to separate the island space from the back wall. This design melds concrete, stainless steel, and wood together in a sculpted island that is a work of art in its own right. Butcher-block style countertops provide a prep surface with the addition of convenient knife storage. Highly modern kitchen cabinets on the back wall provide abundant storage options without detracting from the focus on the artful island. It’s a room that’s light on color variety, but heavy on modernity. The room-wide skylight above provides the perfect lighting source for daytime entertaining while a gargantuan silver chandelier sculpture brings both evening lighting and another piece of true art to the space. At first glance this space might appear to be some sort of futuristic diner scene. 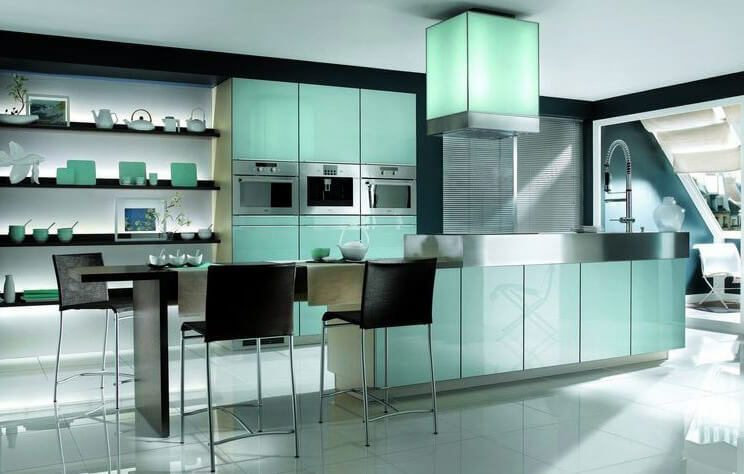 Yet, it is a clear example of how modern kitchen ideas can incorporate both classic and revolutionary styles of design. 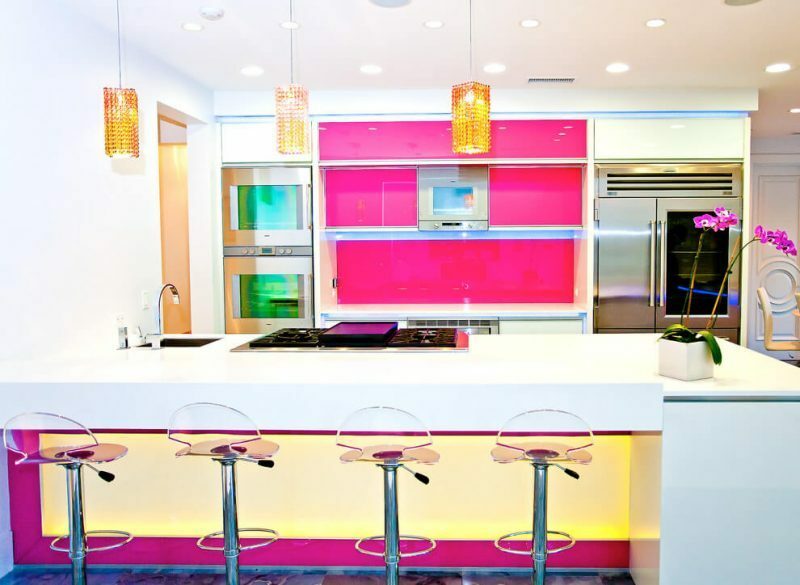 Bright white and fuchsia are clearly the ruling colors of this space. Super smooth surfaces run from walls to cabinets to countertops and the texture even flows to the clear plastic stool tops. The fuchsia accent on the inset of the dining island adds a nice rush of color in an area the may have otherwise been washed out. Amber pendant lights add a third dimension to the two-tone color scheme bringing together a triad of hues that can only be described as striking. With its deep tones this kitchen proves that espresso brown has still not fallen out of favor in home decor. The timeless combination of espresso tones with stainless steel hardware lends itself well to dressing up a back wall with a lovely marbled backsplash and countertop. To add a bright focal point the designer has chosen to light the space with two impressive pieces. The first is the hanging chandelier composed of hundreds of oblong clear glass orbs. This, combined with the underlit ice glass bar top, provides a beautiful focus around which to center any entertaining event. The openness of a space is often its biggest asset. 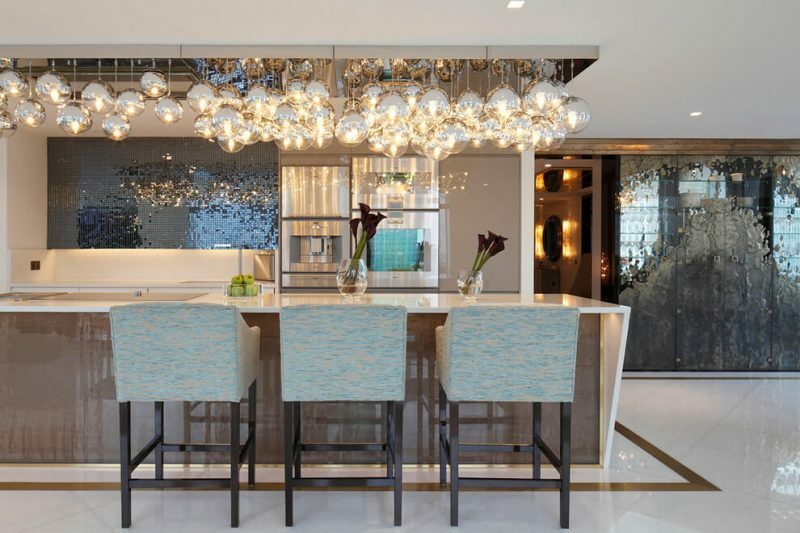 The designer has made use of this fact to make the room look even larger with the use of multiple reflective surfaces. 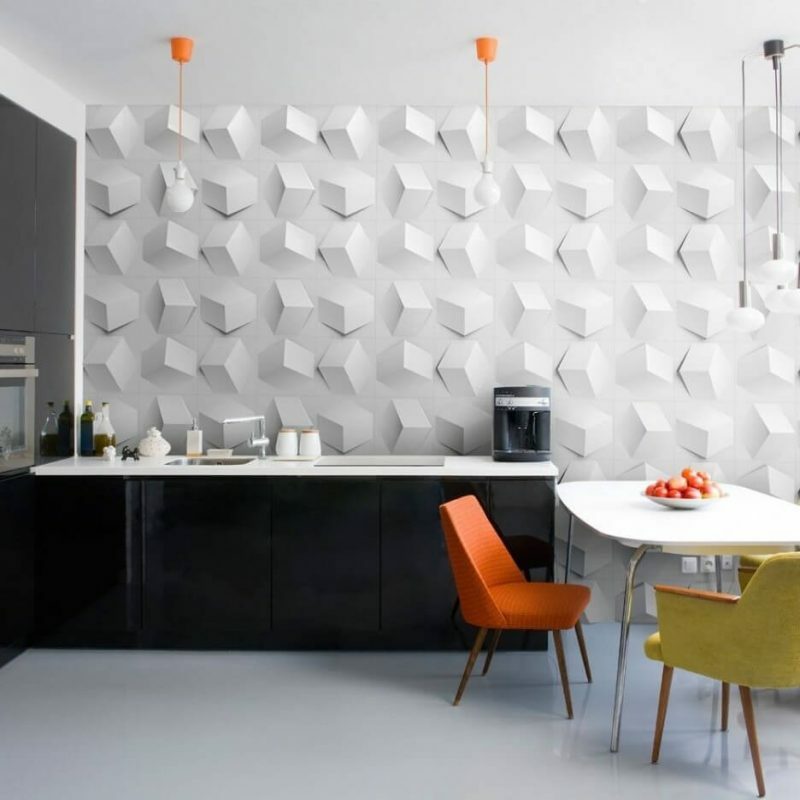 Instead of a traditional backsplash, the area has been opened with the use of oversize wall mirrors above the countertop and behind display shelves that only serve a utility purpose, but also serve as a form of home decoration. This not only makes the room appear to extend beyond the bounds of its walls, it also raises the brightness by reflecting other light sources. Cabinets along the walls are just the right amount of off-white to look pure and clean without becoming overly stark. The true feature of the room, however, is the custom island. Indented end pieces of polished steel continue the reflective theme of the space and the dark cork island front adds a nice contrasting scheme to the cabinets. Ultra-modern appliances finish the look by adding yet another touch of modernism to the design. The feature of this space is clear at the first look. 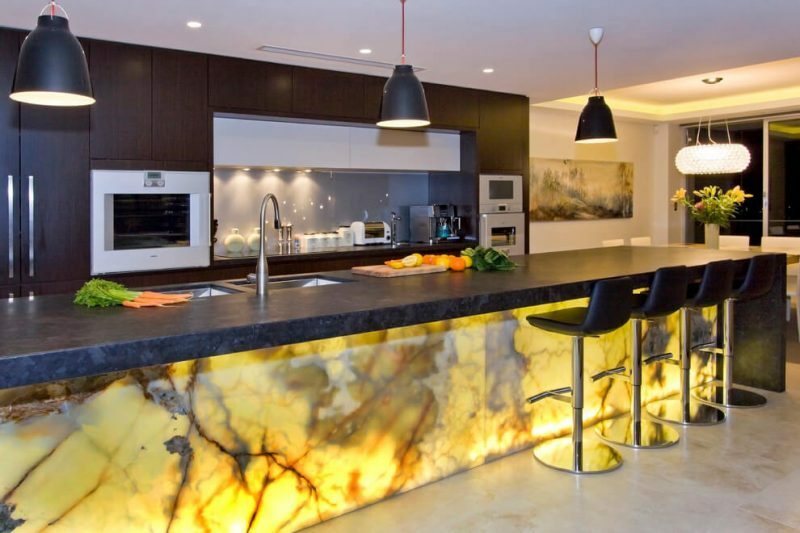 A backlit marble island front sets a cool and soft mood for entertaining. The back wall provides copious amounts of storage in gorgeous, dark-toned, flat front cabinets. Brushed nickel appliance fronts and a soft gray backsplash keep the focus on the marble island while still adding to the smooth elegance of the design. Large dark stone countertops provide an expansive area for food prep or an entertaining space. Black industrial-style hanging lamps bring together the look while black matte leather bar stools carry the modern feel to the seating options. Many modern kitchen ideas make use of materials or styles that have been used for centuries. This design is one example of how these materials can be combined with modern materials to great effect. A beautiful gray brick wall fills the side wall of the kitchen and carries through into the adjacent living area. The back wall, tiled in a mosaic that resembles classic red brick, puts a punch of warm color into the area. The kitchen island’s toasty orange countertop brings together the brick red and gray in a triad of boldness. On their own, the red and gray might have blended into the background, but the orange makes all three seem bold. While the room has many features that mingle into a modern blend, the fireplace shared between the kitchen and living space finishes the room’s look. The wire sculpture in the flame box sets this fireplace apart from others. 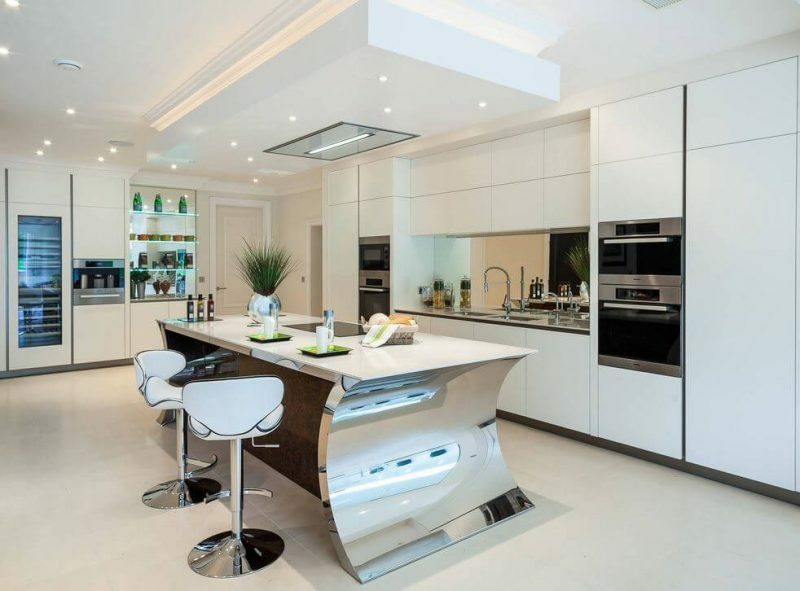 Smooth, polished surfaces are a big element of modern kitchens and this design is no exception. A fluid-like stainless steel island top begins the look with some cabinet faces carrying the same polished feel. Other cabinet faces have been finished in a smooth, but not shiny slate finish. Concrete floors have been stained a deep brown, coated, and polished until they shine. Appliances have been carefully chosen to match the stainless steel on the island and they blend seamlessly into the space. 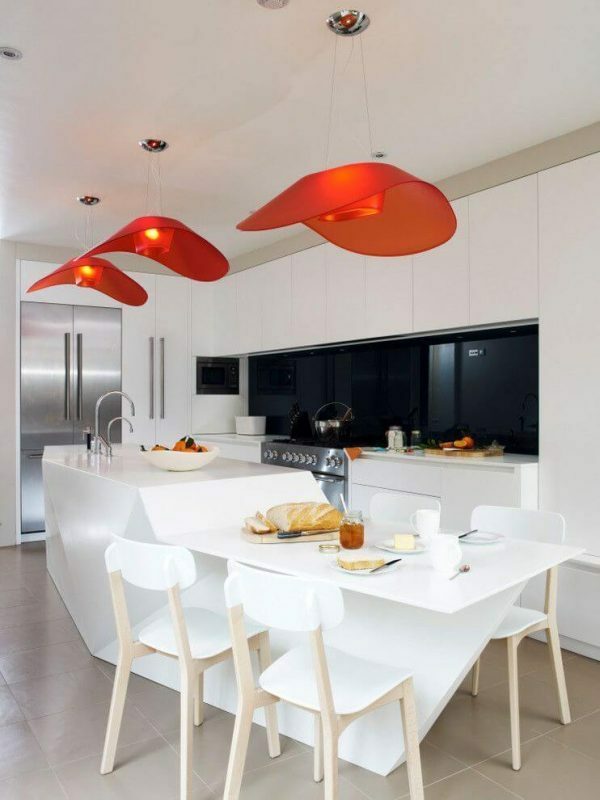 Ombre pendant lights hang over the island and add a reddish accent to the room. Some kitchens just remind us of home–cozy, comforting, and warm. The designer of this kitchen has invoked that feeling by mixing vintage styles with modern elements. The use of subway tile is a classic element that the designer of this kitchen has used to create a more modern mosaic of different earth tones on the back wall. Utilizing vintage-form cabinetry kept the home’s classic feel, but the stainless steel appliances and vent hood update the look. A modern dropped lighting feature blends old and new styles together for a unique look. The Corian kitchen island top is accentuated by bar stool upholstered in a vintage fabric to keep a homey feeling in the space. A kitchen doesn’t have to be extravagant to be modern. Even small spaces can take on a modern look with the right design. This kitchen keeps it simple with white walls, white cabinets, and a white island base. The island’s top is made of a gray granite counter and serves double duty as a prep area and seating area with basic wood and plastic bar stools. A stainless steel countertop and backsplash keep things simple on the back counter. The real strength of this space comes from the deep green color of the single cabinet on the back wall. This combined with the red apple art print provides the simple amount of color needed to turn the space from bland to bold. This design demonstrates that keeping things simple works just as well as creating a complicated design. The elegance of light wood in this space combined with the dark island counter and the creamy lightness of the countertop and backsplash make a striking combination. Keeping the wood surfaces unpainted allows the perfect grain of the wood to shine on its own in the cabinets and island face. 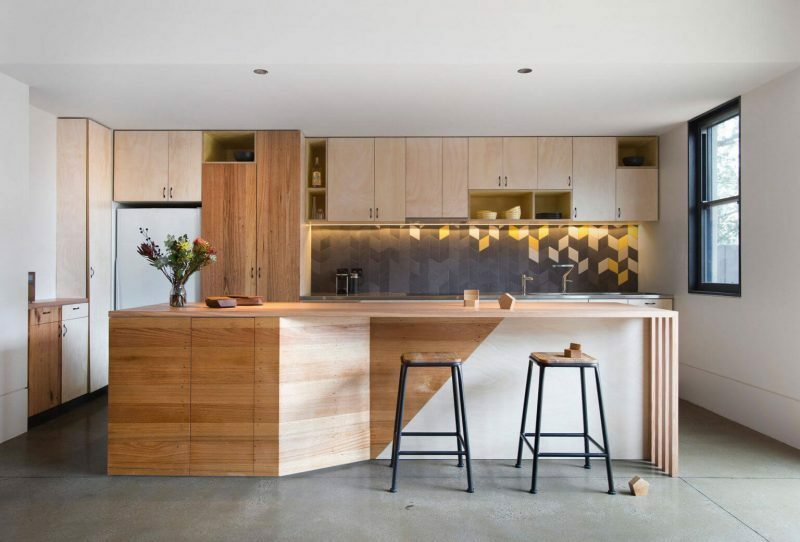 On its own, the wood surfaces could be from any era of design, but the modern countertops and stainless steel appliances bring the look to the modern era. 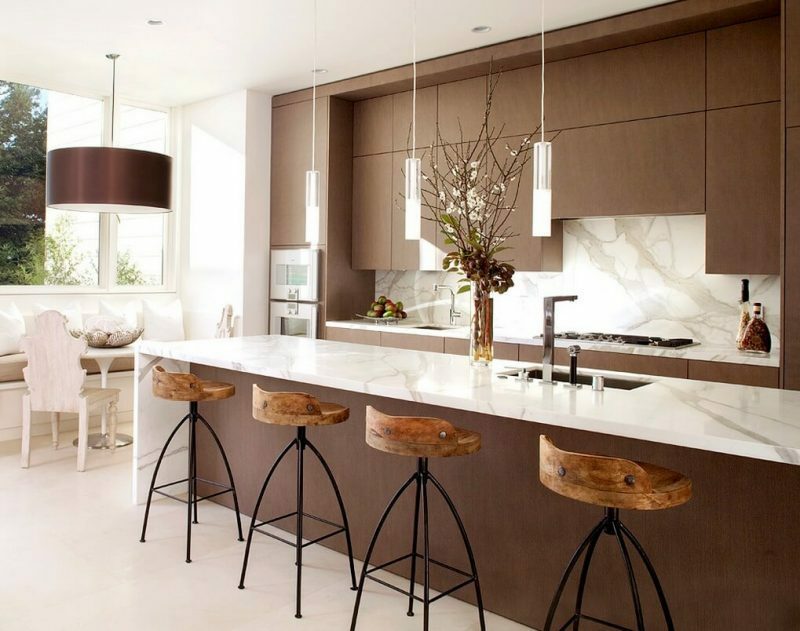 Ultra-modern bar stools and artful pendant lights fully accessorize the room and ensure a contemporary style. Originality is a big part of modern kitchen design. The wall paneling used in this design assures a uniqueness that cannot be matched. Three-dimensional cubes jump out from the wall in random orientations for a rare composition. Shiny black cabinets and white countertops keep things simple to avoid any distraction from the geometric feature of the room. 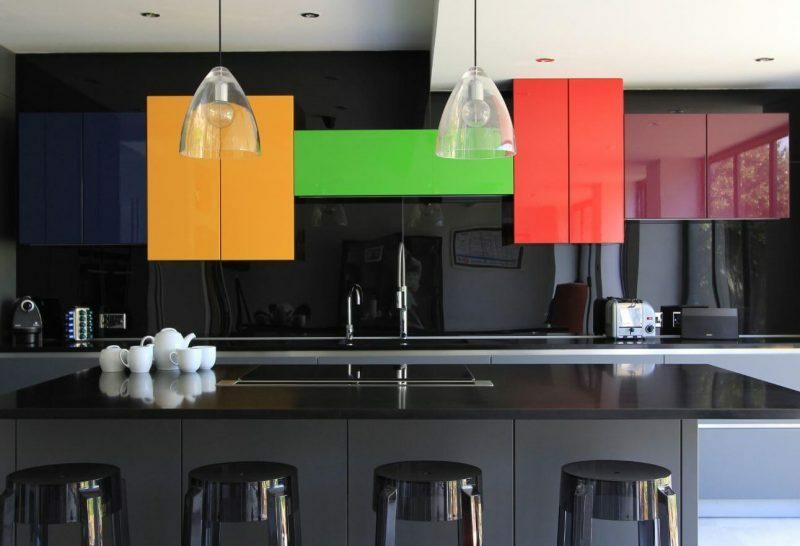 For a flit of color the designer has added incandescent pendant lights which hang from bright orange fixtures. The pop of orange has been carried into the room with the upholstery of one of the chairs while the other chair’s golden color complements the palette. It can be difficult to give kitchenette spaces a modern makeover due to their small size. However, two tricks have been utilized by this designer to make a modern small space. First, the most efficient use of space not only ensures there will be enough storage for kitchen gadgets and tools, but also makes the space seem larger. The designer has created as much built-in storage as the space will hold. Extending the cabinetry to the ceiling makes the room look much taller than it actually is while eliminating any wasted space. The second trick used in this space is the use of a bright color and keeping the tones used in the room to a minimum. Utilizing white for the walls and cabinets opens the room while the use of two small areas of accent color adds depth without shrinking the space. The light blue on the front of the island keeps the palette cool. 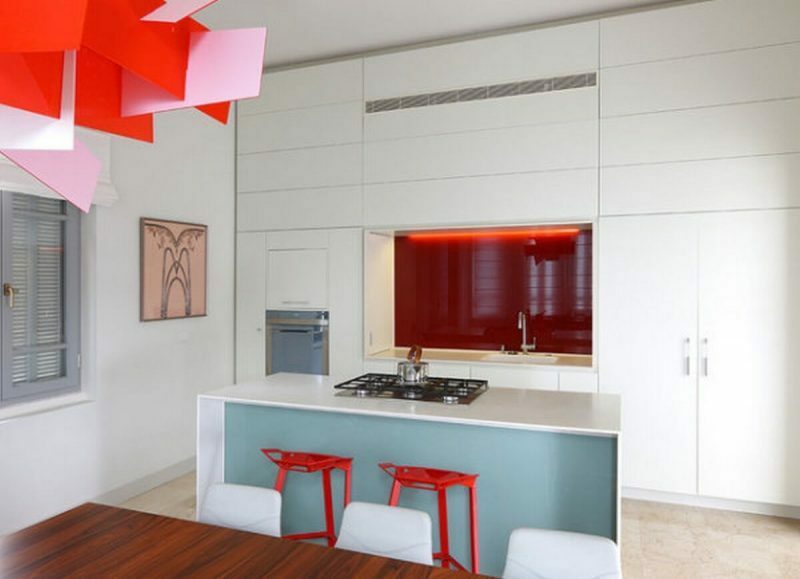 The dark red backsplash wall adds extra dimension to make the room seem as though it recesses deeper into the wall. 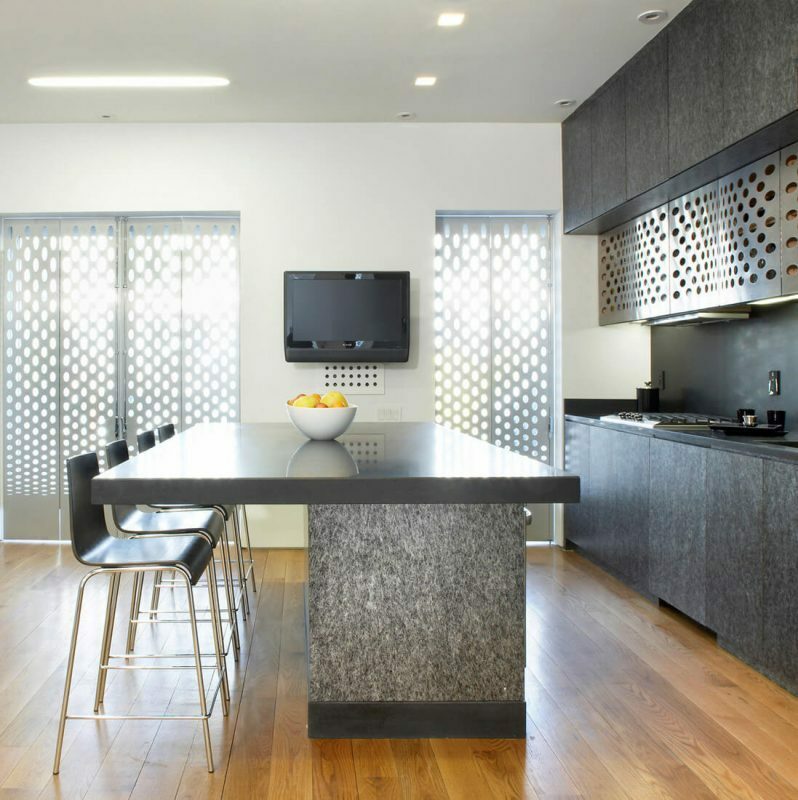 It’s rare to find the use of metallic mesh as a design material in a kitchen, but this design shows how when used appropriately it can add an original look to an otherwise plain space. To complement the light wood floor, the designers chose dark cabinetry. Cabinet and island faces have been finished in a granite-style veneer typically used on countertops. The oversize kitchen island provides more than ample seating ability and is topped in a dark marble. Stainless steel mesh is the cabinet face of one set of cabinets and the same style of mesh with a black powder coating plays with the light through the windows while serving as folding window shutters. The combination of materials not normally used in kitchen designs creates a unique look in this space. The last kitchen remodel ideas it’s totally jaded kitchen idea. The black and white elements of this room provide a nice level of contrast as the backdrop to the jade accents. The design begins with a deep black wall color on every wall of the space. This is opposed by white in two areas: the white wall of the inset shelves on the back wall and the smooth white floors. 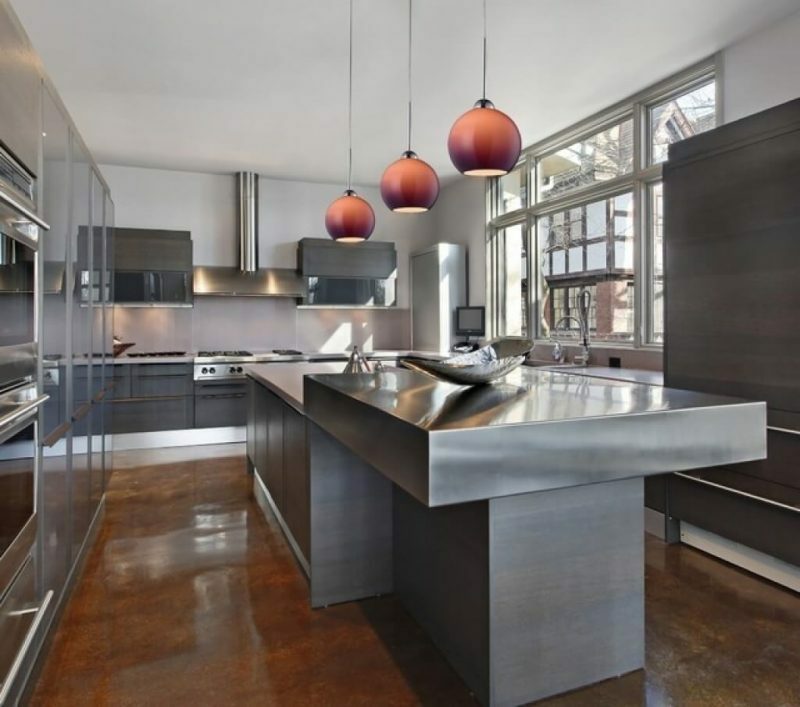 Stainless steel appliances and accenting on the island provide a third texture to the design. However, the true beauty of this kitchen is the jade backlighting and the inclusion of jade accessory pieces on the shelving unit. That’s 21 kitchen remodel ideas in this article. Of all the design ideas that are here, we hope you find the best idea to remodel the kitchen in your home.